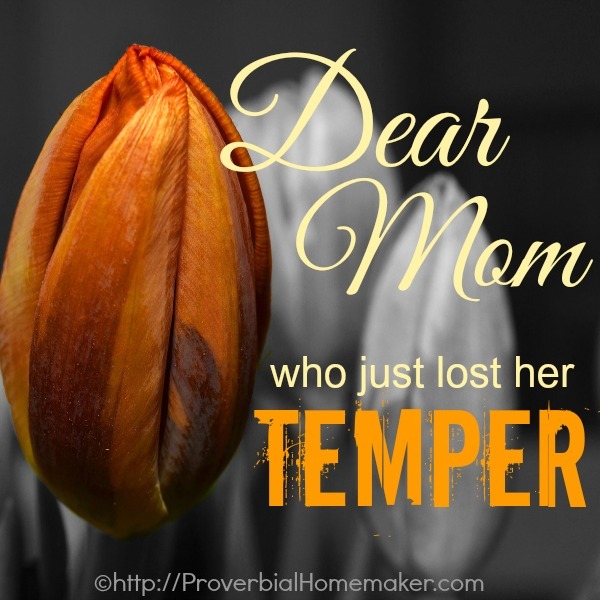 I know you’re feeling guilty over losing your temper with your kids. You didn’t want to. It just seems to… happen. In spite of your best efforts you can’t seem to “fix” the part of you that becomes irritable and reacts so harshly. I know you are conflicted sometimes about how to talk to your kids about their behavior when yours falls so short, so often. You hear them repeating your words and your tone and you cringe. I know you are so often disappointed with the gap between what you want your day to be like and how it actually ends up. You secretly measure your success by whether you yelled that day. You secretly label yourself a “bad mom.” Sometimes you even wonder if there is any hope of change, or what God was thinking when He made you a mom of these precious souls. I know you love Jesus. I know you love your kids. I know you want to be a gentle, joyful mom. Do you know how I know all this? Because I just lost my temper with my kids. All these thoughts and fears and hopes and prayers are my own. Although I have not yet overcome this struggle, I am living in a place of hope and encouragement. More than anything right now, I want to share that hope and encouragement with YOU. I know a lot of things, right? Yes, I realize I don’t really know everything about your hopes and fears, or your struggles and sins, or what your circumstances are right now. However, there are some things I know for sure because they are not dependent upon you and I. They are truths that come from God. We should feel sad over our sin, yet we are not forsaken nor condemned. We all fall short, yet He is not finished working on us. We will sometimes stumble, but pointing them to Jesus is what matters most. We can’t succeed on our own efforts, yet we can do all things through Christ. The truth is, I still struggle with irritability with my kids. I still believe it is important to learn and grow in that area, for my kids’ sakes and for my own. However, I have grown to deeply appreciate something even more important than whether I am a gentle, joyful mom. Here it is. Learn this. Ponder it in your heart. Make this the secret you tell yourself whenever things get hard. Your job isn’t to be a perfect parent. Your job is to point yourself and your children to the perfect Savior. Don’t strive to hide your struggles and your sin. Instead, strive to parent from a seat of humility, showing your kids what it is to confess, repent, and live anchored in Christ. Show them what it means to really live for God, allowing them to witness the work that He is doing in you. If you demonstrate the power of the gospel in your parenting, you have succeeded. 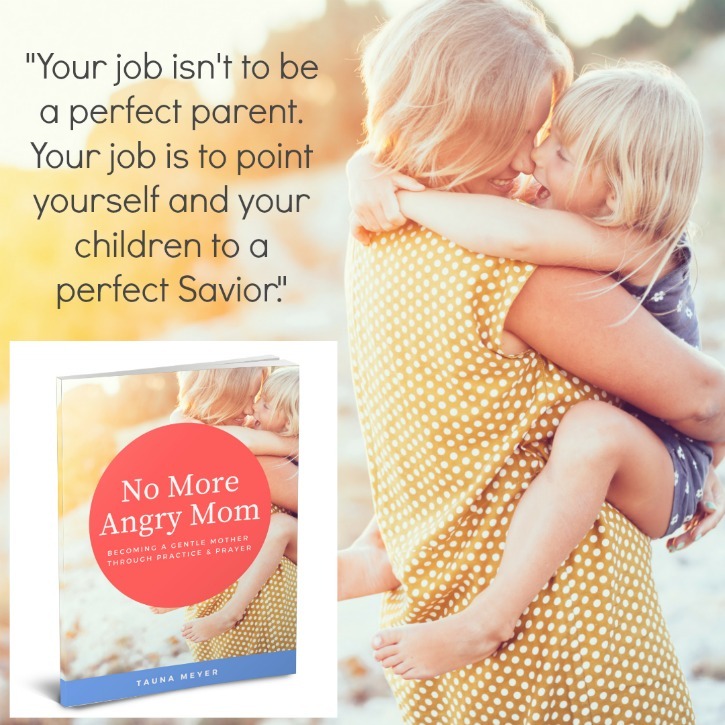 Find practical tools and encouragement for overcoming anger in your parenting with No More Angry Mom! So timely, and a great reminder. I also try to keep in mind that I am teaching my children how to handle their own emotions. I was 19 when I had my first Child, who is now 16, which seems unbelievable to me still! I also have two other children, all of my kids have ended up being 7 years apart by no plan of my own lol. Thank you for all the helpful blogs, but mostly how honest you are about yourself. I think we all see other Moms and think they have it all together, and we are the only ones struggling, it is so comforting to know I am not alone in my struggles, and daily work to try to be better then the day before. Your post here are such an inspiration to me, Thank you again! Thank you for this encouraging comment Rachee! I appreciate it, and so glad you were blessed by it too! I became a mom at 33-3/4 and again at 37. My two “kisses from Heaven” make me a very blessed mom!! I was 32 when I had my first child. And I now have 3 children and turned 40 last Fall. We all lose it at some point it is how we handle it that makes us who we are as moms. Telling our children “hey mom really messed up when she yelled like that or reacted so harsh” allows our kids to know we are human too Forgiving ourselves is another story and God helps me there every time! I was 26 when I became a mom, I have one child. Thankyou for your encouraging words. I think every wife andmother needs to read this post once in awhile…..maybe even once a month would be timely! I was 19 when I had my first child. I have 3 wonderful, high energy boys that try my patience and I wouldn’t trade them for anything! I was 28 when I became a mother. I have three children, ages 1, 3 and 5. I became a Mom at 32. I have one child. I was 21 when I became a mom. I now have 3 kids: one 5 year old boy, and 2 girls who are 2 years old and 3 months old. I had my first son when I was 28. I am now blessed with three handsome sons! I was 24 and I have 3 kids. 2 girls (1 is an angel) and 1 boy. I was finally blessed to become a mom after waiting many, many long hard years at 44 through adoption. My two children, born overseas, adopted at 3.5 years of age are now 11. Though it was hard watching everyone around me getting pregnant and having babies while I couldn’t, I am thankful for the two children God has given my husband and me. There were too many miracles in our getting the children that we have to know that anything other than God’s hand was on the selection. I was twenty-eight when I first became a mom, and I had my fourth baby when I was forty-two. Gotta love God’s perfect timing. I always felt like I was a calm person before I had children, but now I realize that there was no one in my life that could push my buttons like my children can today. They are the sandpaper God is using in my life to smooth the rough edges that I didn’t even know existed. I pray everyday for more peace in my heart and in my home. I was 29 when my first was born. I have 2 boys. I was 36 when I become a mom. About to have 2nd child. I was 26 when I became a mom and I have 3 kids. I became a mom at 29 and have 2 kids. i became a mom at 32 to two beautiful sisters. i was 29 years old and I have only one child. I was 25 when I became a mom. My kids are 4 & 2. I was 25 when I had my first and now I have 3 with one on the way! I can completely relate to losing my temper, but God is so good! He has made me aware of my weaknesses which has helped me rely on Him all the more! I became a mom when I was 32. I have 3 children. that was almost 40 years ago. Today, #4 is 11 and I still need advice and encouragement! Thanks for the encouraging words found here!!! I was 21 when I had my first child. I now have 4 children ages 6 down to 10 months. I was 22 yrs old when I had my first baby. I have 3 with me children and 2 babies in heaven. I was 28 when I became a mom and I have 3 kiddos. I was 27 and have 2 children (so far).